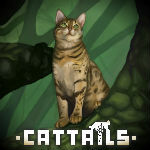 Changing the spare rooms | Cattails: Become a Cat! Maybe the spare rooms could have an actual purpose to them. Like a place to keep a pet that doesn't follow you around. Or some other purpose other than just being a spot to set things down. If you have other suggestions please post them here. There should be a room with something to display any item you have. You can plop it in there and BAM it'll look better than on the floor.